Barn owls are more than just a pretty face. They're ravenous rodent eradicators, capable of clearing their chosen territory of over 1,500 mice, voles and other vermin in just a year when they pair up. 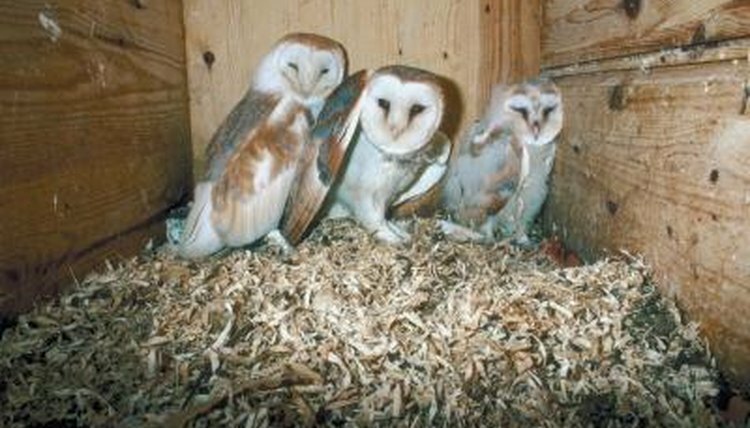 Barn owls don't build nests, preferring to move into ready-made homes in tree trunks or crevices in cliffs, and they have a fondness for human-constructed dwellings, such as pump houses, church steeples and, of course, barns. Encourage these lovely exterminators to take up residence near your home by building a nesting box. Measure out the front, back and top pieces on the plywood using the tape measure. The front and back should be 14 inches by 14 inches and the top piece should be 16 inches by 32 inches. Use the pencil to mark lines along which you'll cut. Saw the pieces from the plywood along your marked lines. Mark off the floor and the end pieces on the pine board using the tape measure and the pencil. Each end piece should be 14 inches by 14 inches, and the floor should be 30 inches by 14 inches. Saw the pine board along the marked lines. Drill 10 holes into the floor piece using the drill and the 1/2-inch drill bit. These will be drainage holes, so you can place them more or less at random. Begin assembling the box by applying glue along one side of the floor piece and then placing one side piece against it. Attach the other side in the same manner. Secure the sides in place using the hammer to insert nails in each corner and then four or five more nails at regular intervals along the bottom of each side piece. Attach the back of the box to the floor and sides by applying glue to the ends of the side pieces and the floor piece, then putting the back piece in place. Secure the back in place with nails. You won't be able to place nails in the corners, as they would interfere with the corner nails in the sides, but you should hammer a nail into the middle of the bottom edge and another on each side, about an inch in from each edge. Insert nails up the sides of the back piece to secure it to the side pieces. Place a nail in each of the top corners, then insert one about every 4 inches until you reach the bottom. Make sure you do this on both sides of the back piece. Secure the front piece by applying the wood glue on the end of the left side and the floor piece and then putting the front in place. Insert a nail in the middle of the bottom edge and then one about an inch from each side edge to secure the front. Pound a nail into the top left corner of the front piece and every 4 inches down the left side to the bottom. Secure the right side of the front to the right side piece of the box by placing a nail in the top corner of the bottom of the doorway and another about 1 1/2 inches down from that. Center the top piece on the top of the box. It should extend an inch over the box on all four sides. Use the tape measure for assistance if necessary. Attach the top to the box by pounding nails into the top and down through the walls. Remember that nails are already in place in the corners, so you will have to work around them. Insert additional nails to further secure the roof by pounding them in at 4-inch intervals along each side of the top.  1 5/8-inch galvanized screws can be used in place of nails.  Allow the glue time to set before attempting to nail the pieces of your box in place. The time this will take depends on the brand of glue and how much you use. It doesn't need to be completely dry, but it should be set up enough to hold the pieces in place so you can hammer the nails in.  Drill 1/2-inch holes in the top corners of the side pieces of the box if you will be hanging it. This will provide openings through which you can slide rope or chain to suspend the box.  Paint the exterior of the box to help weatherize it. Use a color like olive green, black or brown to help camouflage it.  Furnish the owls' home by putting wood chips or sawdust in the bottom of the box.